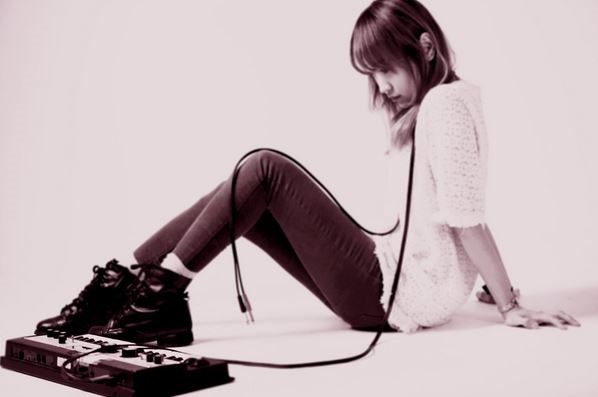 This week’s K-pop Indie Gem focuses on Yukari, a Seoul-based producer, singer, and composer. Yukari doesn’t have a lot of music out. As a solo performer, she released her first EP, Echo, in December 2012, a work composed, produced, and sung by herself. She’s without a label, but that hasn’t stopped her from performing her music as live as she possibly can. Though her music is of the electronic kind, she makes an effort to carry around necessary electronics herself to produce loops and sounds live, and not just perform live. Yukari grew up with music, primarily learning the piano with guitar and bass on the side. When she got to college, she majored in electronic music, learning to the tame the capabilities of the computer to her dream pop style. Like many, she draws inspiration from her everyday feelings, finding electronic music an excellent outlet to channel the surreal sounds of the mind into an audible form. Echo has six tracks along with a remix of one of the tracks by Shin Hyun-jin, making for seven tracks of tranquil sounds accompanied by Yukari’s sweet voice. Most of them start off with clean beats and electronic sounds before going on to immerse the listener in an aural journey. Electronica often plays out as tracks with never-ending melodies, and not necessarily in a good way. But all of Yukari’s tracks are of moderate length with good pacing; in fact, some even seem too short. “Just Friends” is a quiet track and an excellent introduction to the album, playing with the eponymous echo sound primarily in the vocals. The song picks up in the second half, with whispers giving way to a stronger instrumental that build up to a sharp drop. The vocals keep their echo quality throughout, swelling with the music but never getting loud. In “Marginal Man,” Yukari’s voice takes on a more dreamy quality. In contrast to the first track that built up to a point, “Marginal Man” seems to repeat itself while rising to a strange frenzy. That build-up is almost unrecognizable until it starts to wind down toward the end. The result is a track that seems much shorter than it actually is. With “8PM,” the vocals return to a whisper-like quality. The effect is that the effort taken to listen draws the listener further into the music. This song, too, plays with echos, except this time in both the vocals and the instrumental. The different ways in which the melody takes form are probably the most interesting part of this song. After the initial exposition, there’s this tinge of familiarity to the rest of the song as the tune repeats but gets caught up in itself on the way, ending in this cacophony that is only straightened out at the very end. This is the track that was also remixed by Shin Hyun-jin. “Hang On” is one of the bolder tracks, the music being louder and more melody-focused in its intent. The consistent guitar is a pleasure in the middle of all the other sounds, something to hold on to while the song builds. Though the song doesn’t have as much of a mind trap as some of the other tracks — due in part to the consistent focus of notes — it’s a good change up from the other tracks of the EP. “Am I Dreaming?” has a strong pulse throughout. The repetition of the English words are enough to wriggle into the listener’s mind in some almost psychedelic twist. Though the words are said wonderingly, the surrounding sounds build up sufficient pressure around them to bring the music and impact of the words to a higher level. The most obviously upbeat song is “Yule.” It’s also the song where the vocals have the most presence. In a similar manner to “Hang On,” “Yule” doesn’t have a lot of twists and turns like in some of Yukari’s other tracks. It’s a typical yet good electronic song. Though Yukari doesn’t have that many songs out, she intends to have a new release before the end of 2013, around fall. She also keeps a Soundcloud account with her own remixes and some pretty neat tracks that haven’t been cohesively released yet, so do check that out if you’re interested!